Several Malaysian media outlets both online and print versions have highlighted amazing getaways in Malaysia. It is great to know that resorts from Pantai Hill have been featured in these publications. For the media to recognise and highlight these Seremban getaways, it shows that Pantai Hill does genuinely offer a valued getaway destination. However, we would like to add our (resident) opinions to what these media outlets have perhaps missed out in their quick and short description of such vacation destinations. Tired of congested tourist spots?Here are some off-the-beaten-track destinations where you can de-stress and rejuvenate…Several retreat bungalows and boutique hotels such as The Dusun, Awanmulan and The Shorea, offer visitors spectacular views of majestic trees and mountains. They featured 6 destinations in different states. What they failed to recognise is the difference in actual operational status of each resort/hotel destination. Ones in Ipoh, KL, Penang, Melaka and Serendah are proper commercial outlets with hotel licences. The Shorea, featured under Seremban does not have such an operational license and worst still The Shorea’s operations in-fringes on the comfort and peace of their neighbours – partly because of how they have built their structures and how they ignore noise complaints by their neighbours. The Shorea – Built within a tropical forest reserve, the resort is an appreciation of nature itself. Build mostly from recycled shorea timber, it’s a great place for some R&R with magnificent views of the surrounding mountains. We can’t blame femalemag for doing so (because how would they know?). In our experience we find that The Shorea does not appreciate nature. Owners of The Shorea do not respect their surroundings and do not respect nature and they have had multiple run-ins with neighbours regarding water drainage, water usage, water preservation, rubbish disposal in nature, noise, building materials spillage and trash. …family-owned business, which was started over 30 years ago, seeks to promote sustainable farming and jungle conservation…There are five houses — Berembun, Emas, Sora, Perling and Tembusu, which combine elements of Malay and orang asli architecture….This is a perfect spot to marvel at nature, whether a waterfall or the beautiful hills. There are several swimming spots as well as jungle trekking and guided walks to experience kampung life. We find this short reporting by the star to be fairly accurate. This family owned resort were the pioneers of resort business on Pantai Hill and have lived up to their ‘kampung life and jungle conservation’ attributes. They have always responded well to community needs and have earned the respect from the orang Asli community they employ. 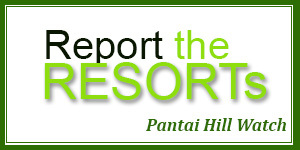 Residents on Pantai Hill do not have a problem dealing with them. Located on the hills hidden deep in the heart of Negeri Sembilan, The Shorea was built in a tropical forest reserve, making it an exclusively tranquil place to spend your honeymoon. If you and your spouse are nature lovers or you seeking for some peaceful rejuvenation, probably even a taste of Balinese honeymoon away from the crowd in Malaysia, this is the ideal forest getaway. If you are a honeymoon couple looking for a tranquil place, we doubt that The Shorea will give you tranquility and peaceful rejuvenation they claim. The reason we say this is because as residents, what we have often observed large group bookings into The Shorea. If you read reviews from Tripadvisor.com.my you will find that people complain about how close their ‘Villas’ (which are actually- small rooms) are to each other and if you are a couple on honeymoon, it is certainly not a choice spot for you. We do agree that Awanmulan is a cozy family run resort. And especially during rainy days there are many misty pockets in the hills around. In our opinion, it is a great place for family and friends only if the numbers are kept low. Just like The Shorea, Awanmulan is located on a residential hill. There are neighbours close by. Due to the open architecture plans favoured by residents on the hill – sound travels intact and easily reaches into the homes of others. Unlike The Shorea owners, the Awanmulan family have left their doors a little open for negotiation and do respond when taken to task. They are also quite professional in their dealings. Our message to Awanmulan is to please watch your numbers so the noise does not put a bad mark on your operations. To potential guests please regulate yourself – noise penetrates deep and we can hear almost every word (although muffled from time to time). A nature lover’s dream, the well-hidden property is mainly constructed using recycled shorea timber (hence its name)… Staff at The Shorea are known for their personalised service – city-dwelling families and couples looking for a relaxing forest retreat will not be disappointed.